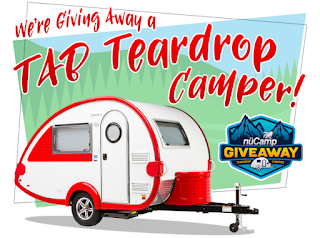 One (1) Grand Prize: A 2019 nuCamp TAB 320S Teardrop Camper (ARV $21,733). Five (5) First Prizes: A $100 All Pro Adventures electronic gift card (ARV $100). Five (5) Second Prizes: A Redbudsuds Epic Suds Soap Pack (ARV $69). Five (5) Third Prizes: A one year membership to Harvest Hosts (ARV $35). Five (5) Fourth Prizes: A 1 year subscription to Rova Magazine (ARV $35). Five (5) Fifth Prizes: An autographed “Teardrop Traveler” book by Mandy Lea (ARV $25).